The Modesto Rotary Club and the Stanislaus County Office of Education (SCOE) announced the selection of four local educators as 2018 Stanislaus County Teachers of the Year at a Rotary luncheon on May 1. In addition, a Jane Johnston Civility Award was presented to one of the 12 finalists for exemplifying the principles of civility. 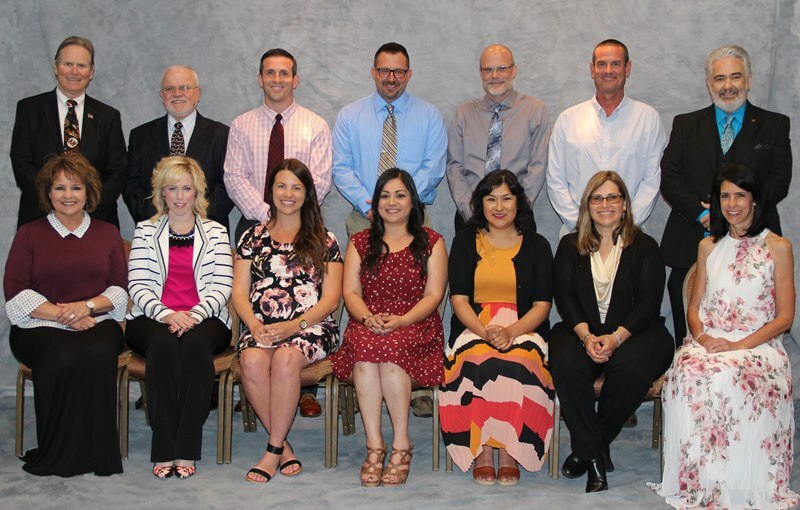 Teachers were nominated by their principals and finalists were selected from 79 nominees representing 16 school districts in Stanislaus County. A selection committee, composed of local Rotarians and educators, narrowed the nominations through a paper screening process and then visited the classrooms of 24 semi-finalists before narrowing it down to the 12 finalists. The 2018 Teachers of the Year are: Angelina Rafatti from La Rosa Elementary School in the Ceres Unified School District – TK-3 division; Gary Carpenter from Agnes Baptist Elementary School in the Stanislaus Union School District – 4-6 division; Leticia A. Rosales from Spratling Middle School in the Keyes Union School District – junior high division; and Ryan Richards from Central Valley High School in the Ceres Unified School District – high school division. The four selected as Teachers of the Year each received a $1,000 cash award from the Modesto Rotary Club Foundation and a $700 Nasco gift card. Mocse Credit Union also sponsored the event and provided funding for the awards, decorations and lunch for the student entertainers. The Jane Johnston Civility Award was presented to Eric Chipponeri from Waterford Junior High School in the Waterford Unified School District. The Civility Award is in honor of former SCOE Assistant Superintendent Jane Johnston, who helped launch the county-wide Choose Civility Initiative in 2010 and passed away unexpectedly in April 2012. Johnston was a member of the Modesto Rotary Club, co-chaired the Teacher of the Year Program, and was active with the Education Foundation of Stanislaus County. The Education Foundation once again honored her memory with this award. “It’s an honor to partner with Rotary to recognize these outstanding teachers – each who helps inspire and shape the lives of young students in our county on a daily basis,” said County Superintendent of Schools Tom Changnon. Sponsors of the Stanislaus County Teacher of the Year program include the Modesto Rotary Club Foundation, Stanislaus County Office of Education, Nasco and Mocse Credit Union.